As a gun owner, it is your moral and legal obligation to keep weapons safely stored when they’re not in use. This statement applies to all shooters, whether you’re a hunter, a casual or competitive shooter, or a casual carry holder. With the Bureau of Justice reporting more than a quarter-million stolen guns annually, and recent spikes in violent crimes across the nation, it is more important than ever to fulfill your duties to properly store your weapons in a fireproof gun safe. The question is, which of the dozens of gun safes is best suited for proper storage of your firearms? What do You Need in a Safe? Choosing a safe isn’t difficult when you’re prepared with the knowledge of what makes a good safe. Before you start browsing the choices make sure you know where you’ll place the safe and understand what you need in the product. You can make a list of the features that you want to make this a little easier. Safes can be placed almost anywhere, though most people choose locations such as corners of the home, the basement, garage, or closet as their chosen location. Once you’ve determined your needs and location for the safe, it’s time to consider the features of the product. Always select a product that is UL and/or Intertek certified for theft and fire-resistance. A UL-rating of 1 or better ensures that your guns are safely protected. The material the safe is constructed from is one of the most important features of the product. Do not rely on a cheap metal safe to provide the thorough protection that you want. Choose a safe made from strong steel material with a gauge level of at least 11. Some of the low-grade steel materials have gauge levels of 20 or 25 and this is a very low number. Choose a safe that has an RSC rating as well. Check the material of the door in addition to the safe itself. A good door is an absolute must if you expect protection and durability. Choose a safe that has a door with at least a ¼” solid plate steel with an RSC rating. The size of the safe is also important. Do not choose a safe that doesn’t allow your collection to grow. 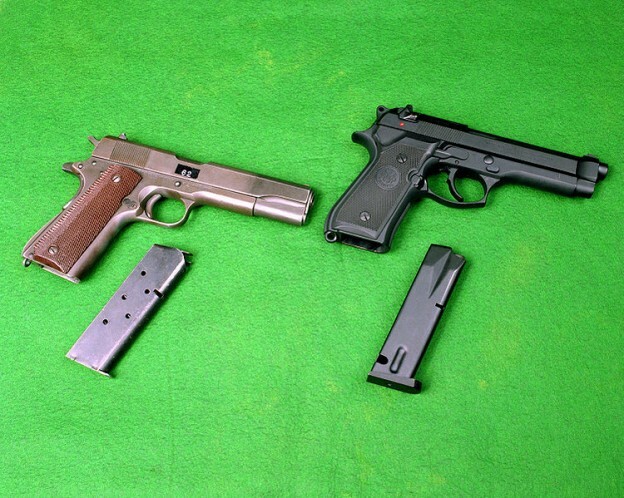 Although the average gun owner has a collection of eight firearms, growing that collection is always fun. You don’t want to continuously purchase the product, so choosing one that is a bit larger than what you need is best. The inside space is the important number here. The average safe has an interior space of 1.2 to 1.3 cubic-foot though larger models are available to accommodate needs. The entire point of a safe is to keep children and thieves out of reach of your weapons. So, it is essential that the product includes a superb locking mechanism. Key locks, combination locks, and keypad digital locks are the locking mechanisms used on today’s safes. Each has its own advantages, though the digital locks are the most secure of the choices. Gun safe costs are yet another important consideration. Set a budget before you begin shopping, fully aware that many affordable safes are on the market that works just as well as the more expensive models. When picking a cheaper gun safe, let your research guide you in the direction of a product that will exceed expectations. Using the above information is of great assistance when you want a great safe.